I considered myself lucky when I flew into New York La Guardia last week from the south. I like that approach because it takes you right over the whole of NY Harbor with a view of the Statue of Liberty and then up the East River before making a right turn, crossing the Throgs Neck Bridge and then turning back again for the approach to the airport. On the trip up the East River, you can see all of Manhattan from the Battery to Central Park. The sheer density of New York always amazes me — and I grew up in it. 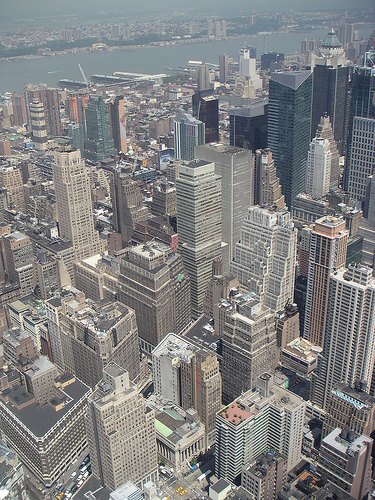 From 1000 feet up, the city looks like a set of Lego blocks stacked one upon another, side-by-side. The density of the buildings and the population is reflected in the density of the arts in New York. There is so much to see and do, events within walking distance of one another, or a short public transit ride away. This thought led me to recollect the Phoenix Fringe board meeting I had attended the evening before my flight. PHX:fringe is an arts organization clearly out of infancy, but still in its awkward adolescent phase. Part of our board meeting focused on a discussion of the very topic of urban density. For three of its four years, the fringe has fulfilled its mission to bring cutting edge performance to downtown Phoenix by dispersing among five venues in three separate and distinct downtown neighborhoods. Phoenix, like many cities in the West, does not have a compact, dense, walkable downtown. Instead it has several neighborhoods where the arts exist, and a limited public transportation system. The geographic dispersion has not helped the festival. Audience cannot easily go from venue to venue without getting in a car and driving; careful pre-planning is needed to maximize opportunities to see performances. We find ourselves faced with a choice: continue the dispersed format or consolidate geographically. The answer to that question seems clear. The next is, in which of Phoenix’s three downtown neighborhoods should the fringe consolidate? Over the next several months, we’ll be looking at where we can find the venues we need, hopefully within walking distance of one another. My internal monologue at 1000 feet up also caused me to wonder whether urban density is a prerequisite to a vibrant thriving performing arts culture, or a result thereof. That’s a chicken-and-egg question I’ll leave for another day. This entry was posted in arts infrastructure, Uncategorized and tagged arts management, board governance, infrastructure, Local economies, performing arts, Phoenix Fringe Festival. Bookmark the permalink.